Josh Godar, A.K.A. Godar A.K.A. Sgt. Sweetz organized this one. It was a point to point race. We met at the Ferry Building and took the ferry out to the start. Finish was at Bender's on 19th & S. Van Ness. 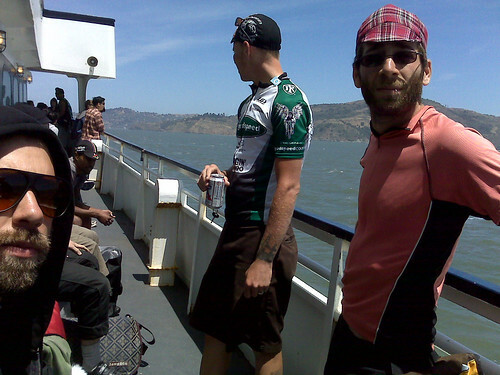 Here we are on the ferry to Tiburon (the start), drinking PBR. I'm on the left in my unibomber costume. Godar's in the middle and Adam Shapiro's on the right - he came in first. Adam and I sat down on the second floor of the boat and planned a route on the way over. He stuck with it while I decided to follow the pack. Should have stayed with the Shap. 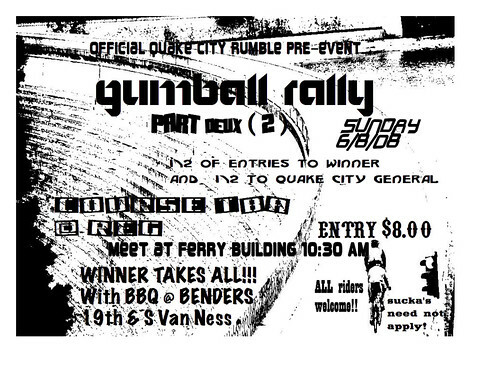 I came in 5th out of 10 and won a $25 entry into QCR, a major alleycat coming up on fourth of July weekend. This was a small race, but a lot of fun. My legs started cramping up on the Golden Gate Bridge, maybe because I haven't been riding much this past week. Otherwise I know I would have smoked everybody as this is my kind of race. Damn. Last Thursday was my final day at Speedway. I'm trying to talk Jetset into hiring me because they are one of the best companies in SF and I have 'nuff* respect for them. In the meantime I'll be spending my days working at Bike Nut and out riding around SF trying to hustle new business for Jetset. They told me that they did not have enough business to hire another rider so last Thursday I proposed that I go out and get them some more clients so they would need to hire me. Pete, one of the two owners, liked the idea. He gave me a company jersey and wished me luck. Hopefully I will be back on the road soon. If your company needs a good courier service, do me a solid and sign up with Jetset here. Tell them R-Y-A-N sent you. They are seriously one of the best companies in SF and will not do you wrong. Plus I want to keep writing about being a bike messenger.